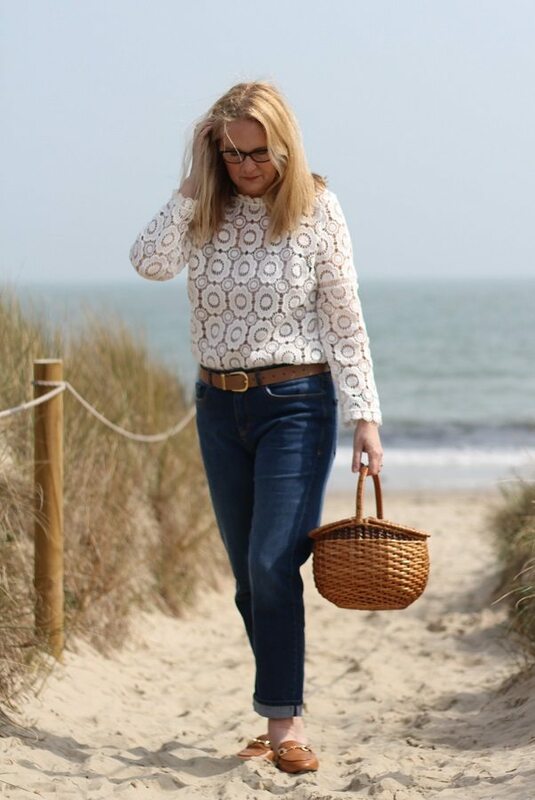 Lace and denim go together like Ginger Rogers and Fred Astaire dont you think? The weather was kind to us, as we neared the coast the warmer and brighter it became. On our arrival the sun shone warmly and we even decided to discard our jackets. 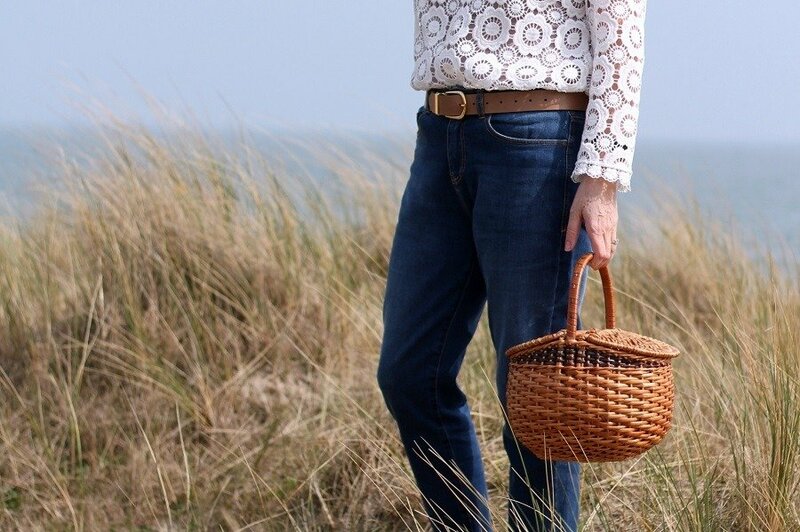 The breeze was slightly chilly by the water’s edge, so we headed for the sand dunes, to take some snaps of my new Baukjen jeans and belt before lunch. Baukjen & why I am happy to collaborate with them. 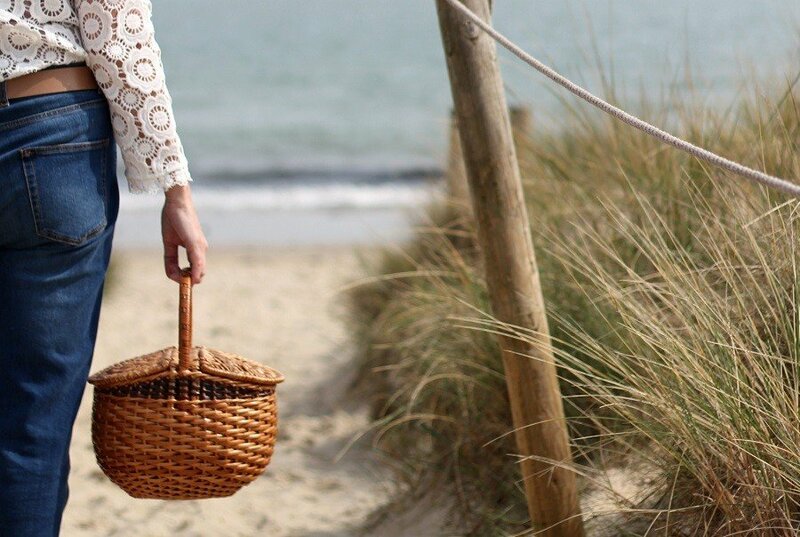 Baukjen are an environmentally and ethically conscious brand. They do not promote fast fashion nor do they ‘over produce’ their garments, they prefer to make small quantities and re-order anything that sells out. They reduce their carbon footprint by having 90% of their collection produced in Europe. Therefore, I am more than happy to collaborate with this wonderfully ethical brand! 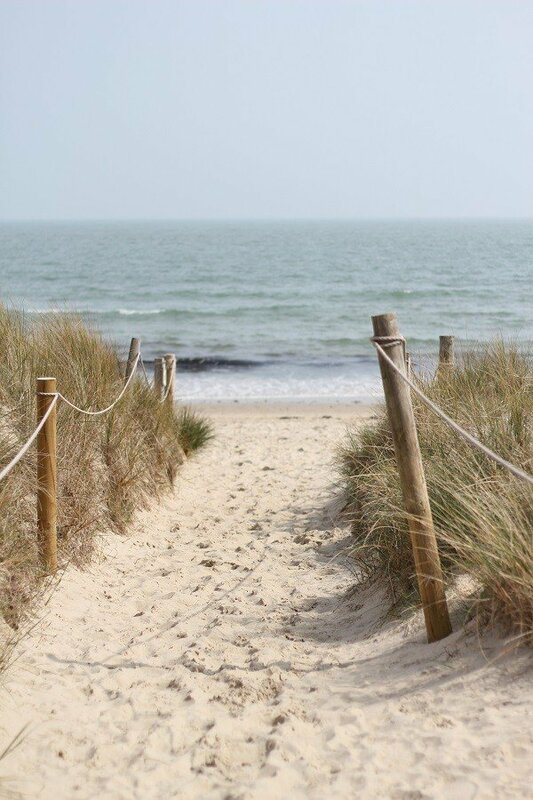 Read more here about Baukjen’s commitment to be environmentally friendly. They also support and donate to many, many charities. Sounds like a brand to get behind and celebrate, I only wish there were more in the world like them! 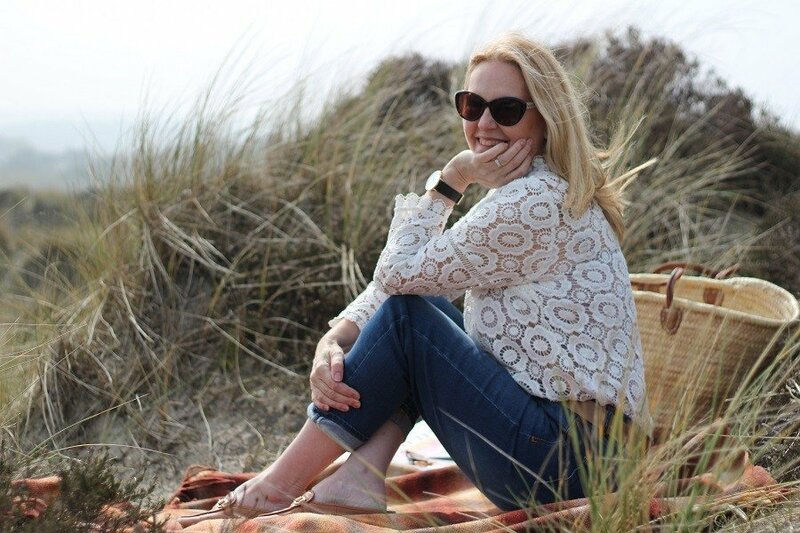 I love a relaxed jean, I consider them to be far more flattering than anything tight and fitted, a relaxed jean can actually make you look slimmer. As an added bonus ‘boyfriend’ style jeans are also very comfy. I can definitely vouch for that, this pair did not disappoint, no wonder they are a best seller for Baukjen. They sit ‘mid rise’ ie. above my hip and below my waist. Incredibly soft, comfy and wearable denim. * New Baukjen Leather reversible belt. Talk about ‘useful and beautiful’ to almost quote William Morris! Very sensible too, we all need a camel and black belt in our wardrobes and this reversible one one takes up less space! Lots more wonderful quality belts to be seen on the Baukjen site here. Baukjen Boyfriend Jeans and leather reversible belt. From my vast collection, mostly picked up from early morning summer boot fairs or charity shops. This blouse is from February 2017 ( take a look at how I wore it back then?) and I’m still wearing and re-wearing it! 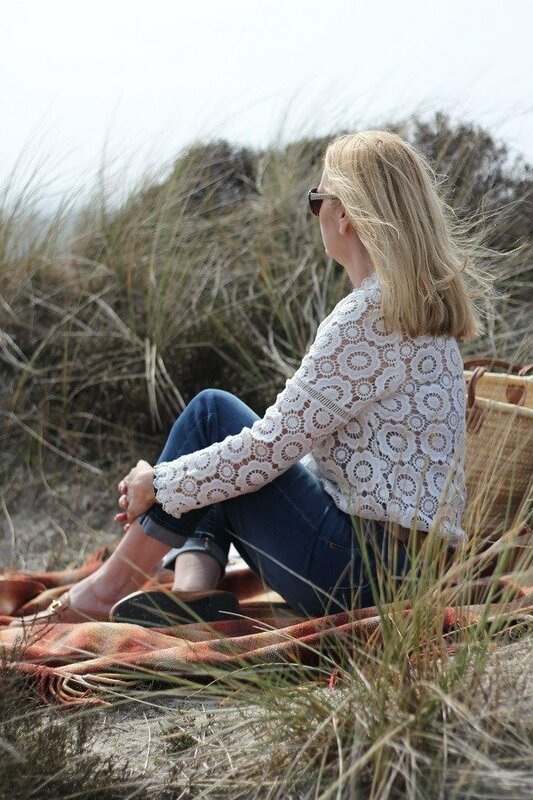 This blouse has worked hard for me over the last two years and has become one of my wardrobe staples. it was from JD Williams I have found a very pretty one here for you, that I would also wear in the same way. Mules again, weather depending it going to be ‘slipper’ mules for me to wear with most things this year. Did you see my recent post? I am wearing the VanDal Mules with a slight heel? This pair are from Vionic they are called Adeline and are still available to buy this year. The tan colour has turned out to be a wardrobe neutral and I have worn them with almost everything! The Pig On The Beach Hotel. A local treasure, lunch was delicious and the sun shone. More on this beautiful and very stylish cosy hotel later as we are going back to stay for the night very soon so watch this space! 6 Older posts you may have missed! Previous Post Skin Care Is Your face Ready For Summer? Next Post On Branding I think I May Have A Label Obsession? What a cute outfit!! I love how you styled it and will try something similar with black lace blouse I own. I love a comfy pair of jeans too!! I wish you had shared more about your lunch…what you had and if it was good. Maybe another post! Love this! So super cute. I love, love, love the jeans! Christine hello and thank you, my jeans are very comfy! Looks like you had perfect weather for your photo shoot and lunch! Lovely setting for your timeless wardrobe features! I love wearing mules for their classic style and comfort. Hi Mary, thank you for taking the time to comment, I love mules too, so easy to wear! You look great! Love the jeans! Thanks for sharing! Do you have the Baukjen label in Michegan? lovely quality and an ethical brand too, win win! I think there are slowly coming up more brands that are more aware of our world health! How fantastic is that! I should check this brand to see if they ship to the Netherlands. I love your photos! Thanks Nancy its a superb brand, do check! I am very proud of these photos too, its was a beautiful day and Marc is getting the hang of photography ! It’s such a great idea that reversible belt isn’t it? Had my eye on that one. Baukjen is my favourite brand as you know. I know you will love those jeans Ashley. Thanks Laurie I have been living in them!